Delegates to the Cites conservation meeting in Thailand have agreed far-reaching restrictions on the trade in critically endangered hardwood trees. Extra protection was given to several species of rosewood and ebony that have been threatened by illegal logging. Campaigners welcomed the move, saying it stood in marked contrast to the slow pace of progress in tackling the ivory-poaching crisis. 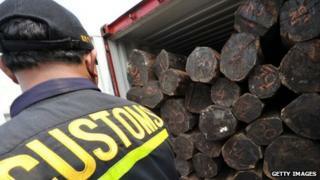 The criminal trade in timber is said to be worth around $30bn (£20bn) annually. The Cites meeting in Bangkok agreed to upgrade the restrictions on species of rare rosewood trees from South East Asia and South America as well as species of ebony from Madagascar. Campaigners were particularly pleased that a variety of rosewood grown in Thailand will now be listed in Appendix 2, meaning both exporters and importers will have to have a valid permit. Growing demand from China's middle classes for luxury furniture has fuelled illegal logging in this product, which can fetch up to $50,000 (£33,000) a cubic metre. Faith Doherty from the Environmental Investigation Agency said it was a big step forward for this species. “Finally, we have a legal tool to use in China, the main destination and where rosewood prices on the black market are spurring a flood of smuggling and associated violence,” she said. Many ebony products from Madagascar also end up in China. Despite domestic legislation banning exports, illegal logging has continued unabated. The restrictions also mean that an exporting country now has an obligation to determine that the number of trees being cut down is not detrimental to the survival of the species. Where Cites really packs a punch is in its ability to impose trade sanctions on any country that over-exports a restricted species. These sanctions would be across the whole range of species regulated by Cites and could prove extremely expensive to offending countries. The move into dealing with timber species was welcomed by Will Travers from the Born Free Foundation. “I think it is exciting to see that Cites is being brave enough in the face of very persuasive commercial operations to address tree species,” he told BBC News.